Küçüksu Palace or Küçüksu Pavilion, aka Göksu Pavilion, (Turkish: Küçüksu Kasrı) is a palace in Istanbul, situated in Küçüksu neighborhood of Beykoz district, at the Asian shore of Bosphorus between Anadoluhisarı and Fatih Sultan Mehmet Bridge today. 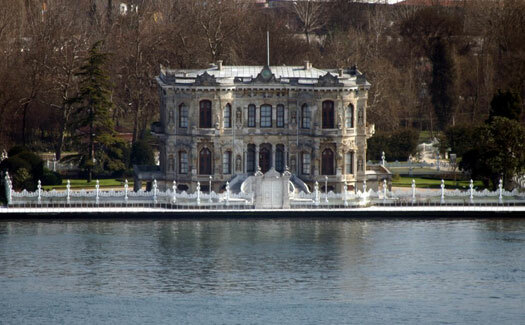 The tiny palace was used by Ottoman sultans for short stays during country excursions and hunting. The palace was commissioned by Sultan Abd-ul-Mejid (1823-1861), and designed and constructed by the Armenian-Turkish architects Garabet Amira Balyan and his son Nigoğayos Balyan in the baroque style. A two storey timber palace on the waterfront here, built during the reign of Mahmud I (1696- 1754), by his Grand Vizier Divittar Mehmed Pasha and continued to be used by Selim III (1761-1808) and Mahmud II (1785-1839), gave place to the new palace, which was completed in 1857. The building consists of two main stories and a basement on a ground area of 15 x 27 m. Unlike other palace gardens with high walls; its garden is surrounded by cast iron railings with one gate at each of the four side. The basement was provided for kitchen, larder and quarters for servants. The above floors reflect the design of a traditional Turkish house so that four rooms in the corners surround a hall in the middle. The rooms at the waterfront have two fireplaces while other rooms having only one. The fireplaces were made out of colorful marble brought from Italy. The rooms have crystal chandeliers from Bohemia. The curtains, the coatings of the furniture and the fine carpets were woven in Hereke. The halls and the rooms exhibit valuable paintings and arts objects. Sechan, stage designer at Vienna State Opera, was charged for the decoration of the interior. During the reign of Sultan Abd-ul-Aziz (1830-1876), more elaborate decoration was added to the façade. Some of the original additional buildings in the garden of the palace were demolished since then. In the beginning of the Republican era, the site was used as a state guesthouse for some years. After a thoroughly restoration in 1944, Küçüksu Palace is open to the public as a museum today. The palace appeared several times in the James Bond movie "The World Is Not Enough" as the mansion of a wealthy woman even if it was reported as a palace located in Baku.